I thought to start off this month’s issue with information on Gaia, the Greek goddess considered to be the personification of earth itself. 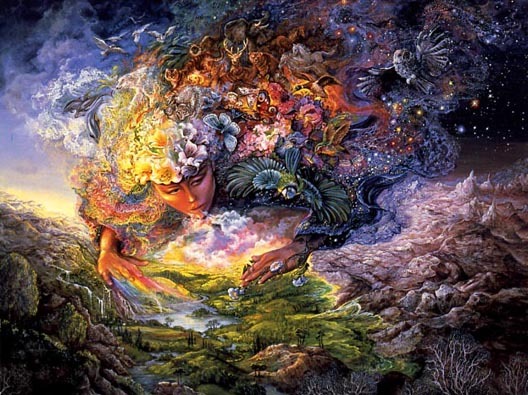 In searching for Gaia art I was thrilled to find a few breathtaking Gaia images by one of my favorite artists, Josephine Wall. Her paintings are a perfect example of how pictures can convey more meaning than words could ever hope to. Or so I thought. 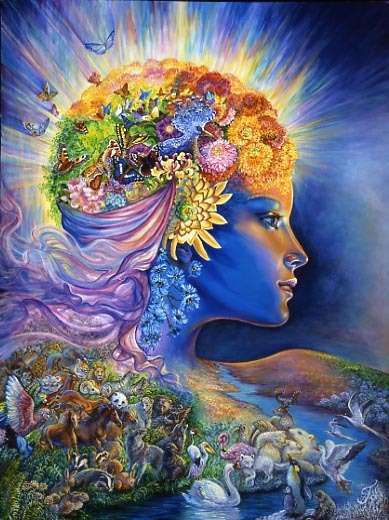 Reading her descriptions of Gaia filled me with as much wonder as her evocative imagery, and I realized no research or historical explanation or new age narrative could better express the concept of Gaia than Josephine’s own brief captions. I craved more Jospehineness and was delighted to find an online video interview with her. 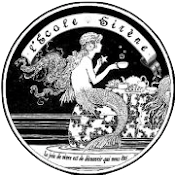 Upon watching it I was so overcome by her humility and nurturing kindness that I dashed off an email to Josephine asking her if I could send her a few brief interview questions about Gaia. Her email response was more intimate and meaningful than any interview could be. I am so humbly grateful to share her words and art with you here today. So lovely to hear from you, and I am honoured that you want to interview me..!! I am always amazed that people want to do this, as all I am doing is 'playing' every day, and fulfilling my heartfelt desire to be creative..!! I am very happy that you like my work, and thank you for your very kind comments. I will do my best to answer your questions. I am not sure which interview you watched, but I am always an optimistic, and happy person which you seemed to have picked up. I am never happier than when I am standing in front of my easel with a painting underway, a brush in my hand, and a selection of my favourite colours to choose from. I do however enjoy time with my family - following my second marriage I now have 5 children and 11 grandchildren which give me great joy. I also have a source of models beyond my wildest dreams - little ones to put wings on, and to be riding mythical animals such as unicorns..!! I also love countryside walks ( I find nature a source of inspiration ), dancing and gardening are my other hobbies amongst others. 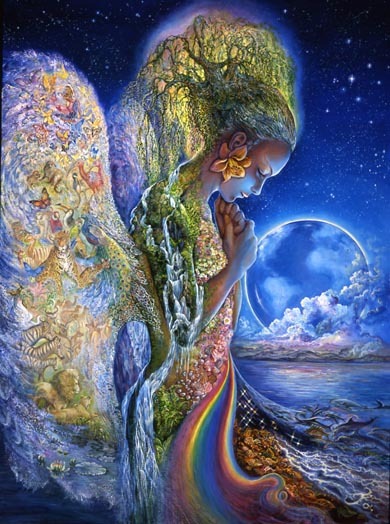 I am a great believer in the power of nature, and Gaia as the Earth Mother is symbolic of most of what I hold dear - that there is a power beyond mortal control, and I hope that she will make sure we will take care of our precious planet - the Earth will endure despite man..!! She hopes that we will learn from our mistakes and repair the damage we have already done. I am very fortunate to have my own gallery ( a dream come true..!! ) and very often I have young , and not so young artists visit me, sometimes for tips and hints on the techniques I use, but most often for advice on how to take their careers forward. I always say to them that all you can do is be true to yourself, enjoy every moment of creativity and share your gift with the world - the world needs more artists..!! I always say that I paint the world as I would like it to be rather than how it is. 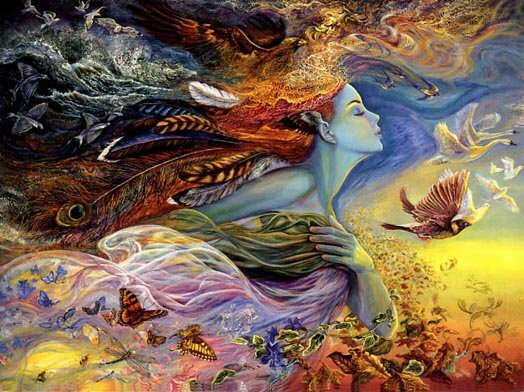 As an artist you are able to create images that portray a world of opportunity, optimism and hope for the future. Our aim should be that when people view our images they are uplifted and transported to a place that gives them peace, and understanding of what is really important in our lives - 'imagination'..!! It is what has made man so successful as a species.